RICE LAKE, WI (May 23) - In a race that saw three different leaders in the last three laps, Dave Baxter made a last corner move to nip Neil Balduc by inches and win the modified feature race Saturday night at the Rice Lake Speedway. With close finishes predominating, other winners Saturday included Curt Myers, Shane Halopka, Adam Soltis and Jason Havel. The special event series, the UMSS, visited the speedway for the first time this year also and their winners included Lee Grosz in the winged Sprint Cars and Joseph Kouba in the Traditional Sprints. 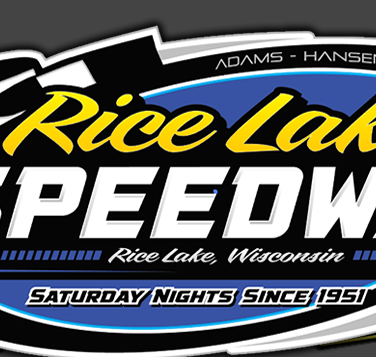 The northern invasion of the Upper Midwest Sprintcar Series (UMSS) continued at the Rice Lake Speedway on Saturday night May 23. Lee Grosz of Harwood, North Dakota passed Winnipeg, Manitoba racer Thomas Kennedy on lap 17 of the 25 lap winged sprint car feature en route to his fifth career UMSS victory. Kennedy was looking for a clean sweep in weekend double-header action, as he took home top honors the night before in the Tabor Memorial at St. Croix Valley Raceway. Grosz, also a winner on Friday night down in Jackson, made the winning pass while utilizing the middle lane with Kennedy running up top. The race was only slowed once under caution with seven laps remaining. Grosz became the sixth different winner in UMSS racing events held at Rice Lake, as he joined previous winners Brandon Allen, Chris Graf, Jerry Richert Jr, Scotty Thiel and Brooke Tatnell in receiving a feature winning trophy in the UMSS RockAuto.com Victory Lane. Grosz started third on the grid behind Thomas Kennedy and his dad Lou Kennedy, Jr. Thomas bolted by Lou on the opening lap and set sail up on the cushion. Grosz quickly positioned himself in second and reeled in fellow northern invader Kennedy. Grosz searched high, low and middle as the laps clicked off under the green flag. Grosz found the middle lane to his liking and ducked under Kennedy exiting turn two on lap 17 for the lead. With 18 laps scored, the lone caution waved. Grosz went unchallenged the remaining seven laps for the $1,000 victory. Finishing behind the two young hot-shoes was Lou Kennedy, Jerry Richert Jr., and Rick Kobs. For the second consecutive night, Richert claimed the GRP Motorsports Past Champion Bonus for the highest finishing past UMSS champion in the feature event. Ultimate Sprint Heat wins went to Jerry Richert Jr. and Lou Kennedy. Thomas Kennedy and Grosz captured the Challenge Races. The UMSS winged sprints have a weekend off before returning to action with another double-header scheduled for June 5 & 6. 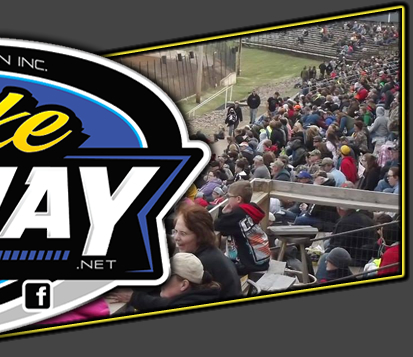 The 14th Annual Billy Anderson Memorial is up next at the Princeton Speedway on Friday June 5 followed by the Big O Showdown at the Ogilvie Raceway on June 6. Look for a special announcement regarding a nice increase in purse money for the top positions at the Princeton race. ast year Joseph Kouba of North Branch, MN drove to an impressive victory at the Rice Lake Speedway on the Memorial Day holiday weekend. Once is good but twice is better, as Kouba captured an exciting win in the UMSS Traditional Sprint Car Series (TSCS) feature on Saturday night May 23. Although Kouba led all 25 laps, by no means did he have an easy go of it. A pack of four cars battled for positions throughout the nonstop 25 lap feature right behind Kouba. That group reeled him in with less than 10 laps remaining. Kouba, running his patented bottom lane, suddenly saw 2011 TSCS Champion Kevin Bradwell to his outside. Bradwell, running up on the cushion, pulled alongside on a couple of occasions but was not able to make the winning pass. Kouba held off all challengers to pick up his third career TSCS feature victory, as he was all smiles in the UMSS RockAuto.com Victory Lane following what turned out to be a very entertaining race for this competitive group of non-winged sprint cars. Following heat race wins by Neal Matuska and Joseph Kouba, the top four drivers in passing and finishing points redrew for the top four starting spots. Both heat race winners drew the front row with Kouba on the pole position. Kouba quickly took off in the bottom lane while the battle raged behind him with cars running both high and low. Near the halfway mark, Kouba had opened up a decent lead. That lead soon evaporated with a pack of four cars closing in quickly. The "wake up call" came from inaugural series champion Kevin Bradwell of Luck, WI. Bradwell pulled alongside Kouba while under pressure himself from two-time series champion Rob Caho, Jr. of Wyoming, MN. Also in the mix were Mike Mueller and Jimmy Kouba. Bradwell was never quite able to gain the lead and had to settle for a runner-up finish behind Joseph Kouba. Caho, Mueller and Jimmy Kouba rounded out the top five. For the second consecutive night, the Traditional sprints ran their feature race with no cautions and all starters were still running at the end on the lead lap! 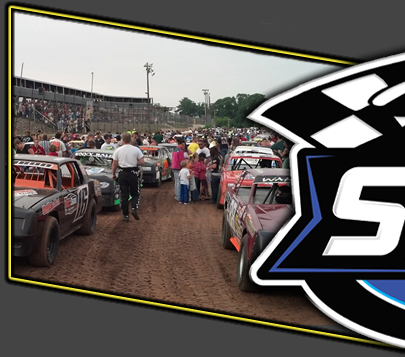 Racing action continues for the TSCS sprints on Friday night May 29 and June 5 at their home track, St. Croix Valley Raceway. Then it's a big triple header weekend when they race at SCVR, Hibbing and Proctor on June 12-14. Come on out and watch this very competitive group of wingless warriors, as they generally put on an entertaining show for the fans. Balduc led the majority of the Modified feature after starting on the pole but he was pressured from the drop of the first green flag. Steve Hallquist and Baxter were racing hard right behind him while Kevin Eder went to the cushion immediately and stayed with the leaders also. Ashley Anderson, Mike Anderson and Kevin Adams were also moving forward after starting farther back in the pack. Balduc continued to run the low line and hold the lead but Baxter was right behind and gradually Eder made the top side work too and he closed up to make it a three duel for the lead. A mid race spin bunched the field and after that, Balduc had plenty of company. Eder was relentless on the high side and slowly he began to reel in the leader. Each lap he would gain a little ground until, with five laps to go, he edged past Balduc and into the lead. Once in front, Eder opened up a couple of car lengths on the field. However, just as he was about ready to receive the white flag, suddenly the car lost control in turn one and he spun, taking himself out of the lead. The resulting yellow bunched the field for a three lap sprint to the finish. Balduc continued to lead but this time Baxter jumped to the outside and pulled up beside Balduc as they raced to the wire. Baxter was ahead by inches as they took the white flag but Balduc fought back in front down the back chute. Baxter got a great run on the final corner and burst past Balduc as they raced to the line to win by a foot or so. Ashley Anderson made some great progress near the end of the race and he closed up to finish a close third with Adams and Hallquist completing the top five. Willie Johnsen Jr led the first sixteen laps of the Super Stock feature before Myers was able to drive past him on the high side late in the event and take his third Rice Lake Speedway win of the year. Johnsen Jr. was closely pursued by Mike Anderson most of the race after he got by Nick Oreskovich to take over second. Eric Olson, Shane Kisling, Myers and Jason Forehand were in a pack close behind the top two and they engaged in a series of three wide, position swapping battles most of the first half of the event. Anderson was a close second when his car suddenly emitted a cloud of smoke and he rolled to a halt on lap twelve, his night completed. This gave Myers the chance to move up to row two for the restart and with an open track in front of him, he was able to move to the high side and he began to close on the leader. Just as in the Modifed main, the lead whittled down a little lap after lap and on lap seventeen, Myers made a strong run off turn four to drive by Johnsen on the high side and take over the lead. Olson was making a big push of his own also, and he dove under Johnsen Jr to take over second but he ran out of time to challenge the leader as Myers drove home for the win. Forehand settled for fourth with Kisling close behind to complete the top five. The Midwest Modified main event came right down to the finish also, with two late passes for the lead in the final five laps settling the issue. Tyler Vernon started on the pole and led much of the first half of the race. He was pressured by Kent Baxter, Tito Viltz and Travis Anderson in the early going with Shane Halopka, Michael Truscott and Curt Myers starting to drive toward the front. Vernon continued to lead as he raced on the bottom side of the track but again, the top side started to be the place to be as Truscott went to the cushion and gradually roped in the leader. Using the high side exclusively, Truscott was able to drive past Vernon on lap nine and take over the lead. At this point, the yellow flew three times in a row for spins and a multi car collision that stopped the action. Bad luck hit Vernon at this point as he had a tire go flat, and his race was over. This put Halopka right behind Truscott for the restart and Michael wasn't sure whether to stay on the top side on drop low. On the final attempt to get the race restarted, Truscott opted to run the low side but when he slipped up the track, Halopka dove under him and took over the lead. Truscott then moved back to the cushion but Halopka had his line established and he drove home for the win after the late race pass. Myers continued to charge and he moved into third in the late going when he finished ahead of Viltz and Baxter. The win was Halopka's second of the year at the track. After being close on several occasions, Soltis finally broke through and got his first Street Stock win of the year. While Soltis led the entire race, the victory was far from easy as he had first Sam Fankhauser and then Cody Kummer all over him looking for a path past him. As Soltis led, Kummer worked his way up from the third row until he was glued to Soltis' rear bumper and he put extreme pressure on the leader. Mitch and Jay Kesan, Fankhauser and Hunter VanGilder all battled for position behind the top two. As the laps ticked off, VanGilder was able to find a couple openings and he moved into third place and began to pressure the top two. Kummer made several bold attempts to dive under Soltis in the corners, and he got very close to taking over the top spot. However, when with just two laps to go he tried one more time, he found himself slidding off the bottom groove and VanGilder slipped past him for second. The battle for second gave Soltis all the room he needed as he hung on for the win with VanGilder and Kummer next in line. Jay Kesan worked his way up further as he nipped his son at the line for fourth. By far the easiest win of the night went to Havel in the Pure Stocks as he triumphed for the third time at the track this year. Mike Miller was the initial leader of the race but when he slid up the track and drove Justin Weinberger with him, Havel knived between Randy Graham and Mike Grover and suddenly found himself in the lead with an open track in front of him and no one near him. Havel quickly put distance on the field as Nick Traynor and C.J. Wagner moved up into the chasing positions. A mid race collision triggered the yellow flag and bunched the field and while Traynor and Wagner tried to stay with the leader, Havel was motoring away from the field with no one able to pressure him. Traynor and Wagner finished in the next positions while Grover put together his best run of the year to finish fourth ahead of a quickly closing Brent Miller. A full five division program will be contested next Saturday, May 30th with a 6:30 p.m scheduled warm up time. The next special event at the speedway will be on Tuesday, June 9th with a mid week program being run in conjunction with Auqafest. All five classes will be racing in a full program and the speedway will then take Saturday, June 13th off so everyone can enjoy Auqafest. Lap Leaders: T. Kennedy 1-16, Grosz 17-25. Cautions: (1) for 52 Lempelius spin on backstretch, lap 18. Cautions: (1) for 29 Thomas backed into turn 2 wall, done for the night. No cautions. 7M McVitty rolled on frontstretch during hot laps, done for the night. Lap Leader: Joseph Kouba 1-25. No cautions. Outstanding feature race!